Due to adjustment of development plan, we bring Isolde, Elena and Polly Awakening Stone in Angel Exclusive this time. Sorry for the inconveniences this may have caused. May the angelic power be with you! Description: Take your favorite Angel with you! 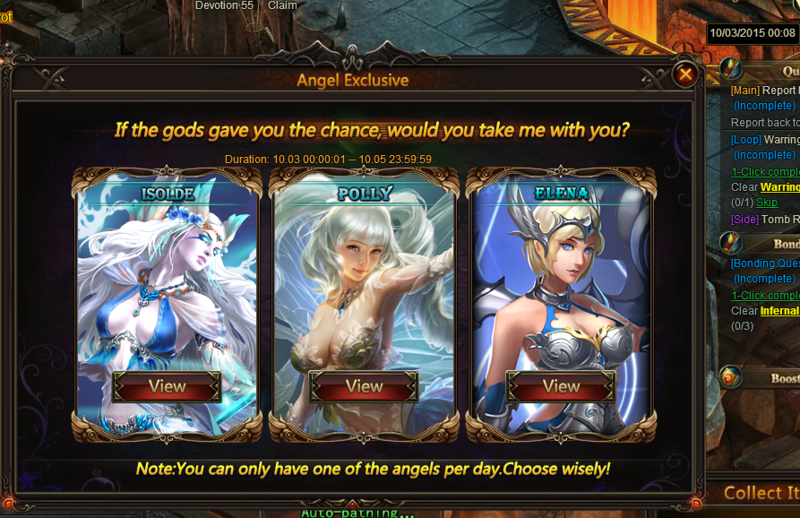 In the Angel Exclusive there are Polly Awakening Stone, Elena, and Isolde waiting for you! Which Angel do you want to join your world? Choose one angel and complete tasks, then you can take him/her into your team! Description: Meet certain achievements to gain Sapphire and Angel Bonus Card for bonus in Angel Exclusive. Description: Reach the required Devotion and spend diomands to get Holy crystal! Description: Consume Angel Tear and spend diomands to get Angel Tear! More exciting events are coming up through Oct 3 to Oct 5 (Server Time) , check them out in the in-game Hot Events menu now! 2019-4-21 22:57 GMT+8 , Processed in 0.061612 second(s), 52 queries .